Practice Analog Communications questions and answers for interviews, campus placements, online tests, aptitude tests, quizzes and competitive exams. This set of Analog Communications Multiple Choice Questions & Answers (MCQs) focuses on “AM Wave Representation”. 1. AM waves is represented by which equation? Explanation: Amplitude wave is represented by [1 + um(t)].c(t), where c(t) is carrier signal, m(t) is message signal, u is Modulation Index. Generally, c(t) = Accos(wct), Ac= Amplitude of Carrier Signal. Explanation: Capacitive reactance, Xc is low for high frequencies as Xc=(1/wC), where w is the frequency and C is the capacitance. Due to this, the high frequencies are shunted to ground and are not transmitted. 3. If each element of signal occupies 40ms, determine its speed? Explanation: Modem is device that can modulate carrier wave as well as demodulate transmitted modulated signal to decode the original information. When data rate in bps is upto 600, modem is considered having low speed. 5. Modulation is also called detection. Explanation: Modulation is encoding the message signal for efficient transmission. Whereas, Demodulation is the process to extract or decode the original message signal from the transmitted modulated signal. Demodulation is also called detection. Explanation: Woofer is considered as a low frequency loud speaker. It has a range from 10Hz to 500Hz. So it is better to use low pass filter for connection. Los Pass filter allows low frequencies to pass while high pass filter allows high frequencies to pass. Band pass filter allows a range of frequencies to pass whereas. Band stop filter does the opposite. where l = length of antenna and ʎ=wavelength. Explanation: Antenna is used for converting electromagnetic radiation into electric currents or vice-versa. If the length of antenna is equal to the whole wavelength then the radiation at right angles is zero. 8. Power of carrier wave is 500W and modulation index is 0.25. Find its total power? Explanation: Frequency deviation is the difference between an FM modulated frequency and the carrier frequency. Commercial FM broadcasting uses a maximum frequency deviation of 75 KHz and maximum modulating frequency is approximately 15KHz. 10. Which of the following cannot be the Fourier series of a periodic signal? Explanation: x(t) = Cost + 0.7 does not follow Dirchlet’s conditions. Fourier series of a periodic signal will only be applicable if it satisifies Dirchlet’s conditions firstly. Dirichlet integral states that a finite number should have finite number of discontinuities and also have finite number of extrema. x(t) doesn’t satisfy any of the criteria, whereas other options satisfy Dirchlet’s conditions. Thus, x(t) = Cost + 0.7, cannot be the Fourier series of a periodic signal. Sanfoundry Global Education & Learning Series – Analog Communications. 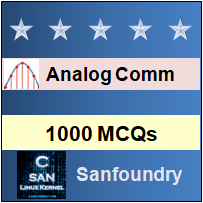 To practice all areas of Analog Communications, here is complete set of 1000+ Multiple Choice Questions and Answers.